As if the onset of Summer wasn’t enough to make us feel great, the month of June has a host of brilliant comedies and feel-good films to be released this year. From the hotly anticipated comedy 22 Jump Street to Cedric Klapisch’s heartwarming Chinese Puzzle, there are plenty of laughs to be had over the next 30 days. However, it’s not all Channing Tatum’s abs and Jersey Boys musical numbers, there’s also tear-jerking true-life stories, spine-tingling horrors and heart-pounding thrillers. Why Should You Watch It? The sequel to 21 Jump Street has been hotly anticipated ever since it was alluded to in the closing scenes of the 2012 film, with the concept of Schmidt (Jonah Hill) and Jenko (Channing Tatum) going undercover at a college already being part of the plan. As a result the entire plot of the sequel sounds very similar to the first film, however, as the saying goes: If it ain’t broke, don’t fix it! 21 Jump Street was so successful due to its ingenious mix of a strong story, witty characters, continuous hilarity from Hill’s sassy one-liners and Tatum’s apparent obliviousness to his own comedic genius (which only makes him all the funnier) and, of course, Dave Franco’s perfect teeth. 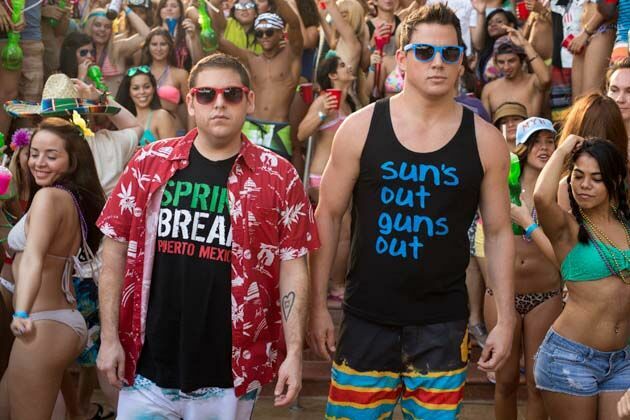 With 22 Jump Street lined up to be more of the same it looks like we have a sequel on our hands that may just live up to the original, if not surpass it! Why Should You Watch It? Fruitvale Station is the harrowing true life story of Oscar Grant III (Michael B. Jordan), a 22-year-old American who was murdered on New Years Eve, 2008. Although at times difficult to watch, Oscar’s story deserves to be shared as we’re given a glimpse into the people behind the headlines and explore the serious issues which continue to plague society. You will undoubtedly leave the cinema with tears in your eyes, a lump in your throat and anger in your heart but an appreciation that the injustice Oscar faced has been told nonetheless. Why Should You Watch It? Yet another true story, this time inspired by Dido Elizabeth Belle (Gugu Mabatha-Raw), the illegitimate mixed-race daughter of a Royal Navy Admiral. Belle was raised by her aristocratic great-uncle with her ancestry granting her access to certain privileges, however, the colour of her skin still excluded her from her traditional social standing and she was often left isolated and forlorn. Belle’s plight actually led her great-uncle, the Lord Chief Justice, in a bid to end slavery in England and it’s surprising that her fascinating story has not been adapted for the big screen sooner. With a star-studded cast that includes Emily Watson, Tom Wilkinson, and Harry Potter’s Tom Felton, this is sure to be one you won’t want to miss! Why Should You Watch It? Karen Gillan stars as Kaylie Russell, a young woman whose brother is convicted of murder. However, Kaylie knows something that can clear her brother’s name, all she has to do is prove that the crime was actually committed by a supernatural power. Oculus has everything that you would expect from a good horror film – spine-tingling suspense, gore, and scares that are set to terrify even the most hardened of horror fans, setting up the film to be the first installment of a petrifying new franchise. Why Should You Watch It? John Green’s bestselling novel of the same name may not be to everybody’s taste but the big-screen adaptation is one of the most anticipated films of 2014. The Fault In Our Stars tells the story of Hazel Grace Lancaster (Shailene Woodley), a teenage girl who is battling cancer and one day meets cancer survivor Gus (Ansel Elgort) at a support group. As the story progresses we track not only their relationships with each other, their friends and family, but also how they cope with their respective illnesses and the overall impact that it has on their lives. Shailene Woodley has already given standout performances in The Descendants and Divergent, proving that she is more than capable of giving a heartrending and well-rounded performance as protagonist Hazel, which affirms one thing: there will not be a dry eye in the cinema by the time the credits roll! Why Should You Watch It? This heartwarming comedy is the third in the trilogy of writer-director Cedric Klapisch’s ‘Trilogy of Xavier’, which has been tracking the character of Xavier from a college student to family man. In Chinese Puzzle, which also works as a stand-alone film, Romain Duris returns as the leading man, and we follow him as he moves to New York in order to be closer to his two children who recently emigrated there with their mother. Audrey Tautou also stars in this lighthearted film that is perfect for when you feel like some easy viewing! Why Should You Watch It? Let’s face it, you will need a little pick-me-up after The Fault In Our Stars and Jersey Boys is just the ticket! The latest stage musical to be adapted for the silver screen, Jersey Boys is directed by Oscar-winning Clint Eastwood and tells the story of how iconic 60s group The Four Seasons came to be. Not only will Jersey Boys be full of some of the greatest hits of the swinging 60s (trust me, you will know more of their songs than you think! ), Broadway star John Lloyd Young is reprising his Tony-award-winning role as lead character Frankie Valli. Jersey Boys looks set to be a brilliantly feel-good adaptation of an incredible musical, and with a cinema ticket being just a fraction of the cost to see the show in London’s West End, how can you resist?! Why Should You Watch It? Jon Favreau stars as Chef Carl Casper, who suddenly quits his job in a prominent LA restaurant after refusing to give in to his controlling boss’ (Dustin Hoffman) demands. Chef Carl soon finds himself in Miami and teams up with his friend and family to launch a food truck and take to the road, where he’s reminded of his passion for the kitchen and zest for life. Chef is yet another feel-good comedy set to cheer up the month of June, so be sure to check it out! Why Should You Watch It? Ever since Love Actually was released ten years ago we’ve seen an influx of films that focus on interlocking love stories. From Valentines Day to New Years Eve to He’s Just Not That Into You, it’s become something of a trend for romantic movies. Third Person is another less Christmassy and less British version of the interwoven characters seen in Love Actually, following three couples in three cities: Paris, New York and Rome. What Third Person lacks in Christmas and London it makes up for with it’s star-studded cast with Mila Kunis, James Franco and Liam Neeson just three of the names associated with the film, building it up to be a great watch! Why Should You Watch It? As well as being a description of Britain’s weather, Cold In July is also the newest edge-of-your-seat thriller to hit cinemas. Telling the story of a protective father who meets a murderous ex con, Cold In July explores what happens when people deviate from the path they’re on and descend into a downward spiral of violence and corruption. This film promises lots of high-tension twists and turns and is set to be one of the most satisfying and memorable thrillers of 2014.